Continued use with little conscious thought sometimes downplays historical importance. As accoutrements go, a “hoppis strap,” “portage collar,” or “burden strap” by any other name falls square in this category. If one of living history’s major goals is to travel back in time and arrive unnoticed among one’s peers, is not a humble accoutrement that disappears within an impression’s context a huge success? More by luck than diligent research, my first leather portage collar is the sole survivor, other than “Old Turkey Feathers,” of my original persona: a retired voyageur hunting to provide meat for a local trader’s post near the headwaters of the River Raisin in the Old Northwest Territory. As the voyageur persona progressed, I acquired a red, four-point, Whitney wool blanket with the intention of hand-sewing a capote to ward off the Michigan cold. Before I could hack the blanket apart, the historical me learned how to “wear a blanket,” but carrying a folded blanket while taking a shot at a white-tailed deer or a flushing rooster proved difficult. About this time, Mark Baker began writing his column, “A Pilgrim’s Journey,” in MUZZLELOADER MAGAZINE. Early on, Baker described his bedroll and how he used a “tumpline” to secure the blanket and its contents, which he carried slung over his shoulder (Baker, I, 10). His bimonthly columns popularized the word “tumpline,” which in his case represented a specific style of burden strap. Unfortunately, “tumpline” became synonymous with any carrying strap, regardless of style, time period, geographical location and/or station in life. In hindsight, my research techniques and documentation sources at that time were limited—everybody’s were. Despite possessing a rudimentary understanding, I realized Baker’s longhunter persona differed in many ways from my Great Lakes voyageur. The tumpline he used was not the same item as the portage collar I was reading about, and I felt the latter was more in keeping with my new-found hunting companion. As I say, more luck than astute research. By the time I found a cowhide cutting on a trade blanket, I had abandoned Mark Baker’s design and set about combining the descriptions of Nute/Sherman Hall, McLeod/Archibald McDonald and the James Hanson illustration. I measured across my chest and back to where I thought the blanket roll should ride. Based on that dimension, I cut the brow band forty-two inches long and three inches wide in the center, tapering to two inches at each end. I stitched two pieces of the same leather together to make the tails, which are a few inches under eight feet long and taper from one inch to one-quarter inch. The one inch ends are sewn to the brow band. The entire strap was treated with neatsfoot oil, and after twenty-five-plus years of faithful service, the leather is still soft and supple, yet strong enough to drag a white-tailed buck from the glade in the manner Colonel James Smith described (Smith, 81). The first concern of all living historians is safety. 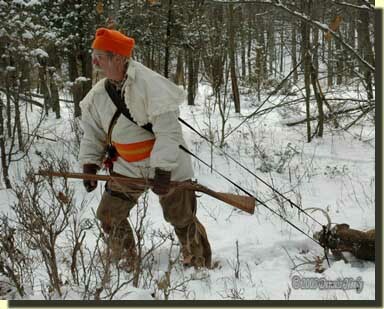 Safety is especially important for traditional black powder hunters who push beyond re-enacting to the actual taking of wild game in a woodland setting. The few narratives that I relied upon told of placing the brow band upon the forehead to carry any kind of load. I resisted that temptation, and still do, because I did not wish to risk injury to my neck. Further, my primary need for the portage collar was to transport the blanket roll. I surmised lugging the bedroll around the forest with the brow band across my forehead would prove just as disruptive and unproductive as carrying the blanket folded and draped over a forearm. On many sojourns the portage collar’s wider center passes over my right shoulder, across my chest and under my left arm, the opposite of how I carry my shot pouch and horn (being right-handed). 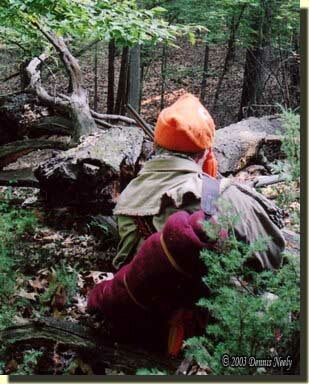 This practice distributes the weight of the shot bag, horn and blanket roll evenly on both shoulders, and I find it more comfortable for still-hunting or long-distance traveling. For short forays, I rest the collar’s brow band across my upper chest and around both shoulders. This method restricts upper arm movement to some extent and hampers mounting the Northwest gun in a fluid manner. I reserve this technique for situations when the probability of a quick shot is low or when the portage collar is used to pull heavier weights such as skidding a canoe or bateau, dragging a deer out or transporting bundled shelter rafters to a campsite. Spreading the burden across the chest distributes the load evenly on the upper body and the effort feels more natural without putting undue stress on the spine and especially the neck. And from later research I learned utilizing the upper body and/or shoulders is period- correct. From the mid-18th century through the close of the 19th century, backcountry observers describe these pack straps by a variety of names: burden strap or band, carrying belt, strap or string, squaw line, hoppus, hoppas or hoppis strap, matump, tumpline, tump strap, portage sling, and of course, portage collar. No doubt there are other names hidden in journals and narratives of other ancient woodsmen, and attempts to clarify the intended meaning by editors and writers often muddy the waters, rather than clarify them. In contrast to Baker’s tumpline and in comparison to Nute/Sherman Hall’s portage collar, “hoppus strap” seems to apply to a woven strap, as described by Charles Johnston, used or closely associated with Native Americans and constructed by weaving natural fibers. But at the end of his “List of Supplies” for the Corps of Discovery in 1803, Meriwether Lewis adds in “Dress’d leather for Hoppus-Straps.” (Brandt, 432) So can I call my portage collar a hoppus-strap? In part, the confusion arises based upon the observer’s (or editor’s) background, woodland experience and to some degree, time period. Yet, despite the sketchiness of a narrator’s choice of words, the use of a burden strap by whatever name appears to be more common than many re-enactors think. This is an important consideration for the traditional black powder hunter. In the end, a living historian bent on re-creating a hunter hero’s exploits must pay careful attention to match the name, the material and the construction technique to the implement he or she chooses—and be ready to support those choices with solid primary documentation, existing artifacts and period illustrations based on a persona’s time period, geographical location and societal station in life. Thus, by luck, the term “portage collar” best fits the leather burden strap of my current trading post hunter persona, centered in the lower Great Lakes region, near the headwaters of the River Raisin in the Old Northwest Territory of the 1790s.